Are you a singer? Do you live in the San Francisco Bay Area? Do you want to join a musical group? We are currently searching for talented men and women to join our super fun group of 13 singers. 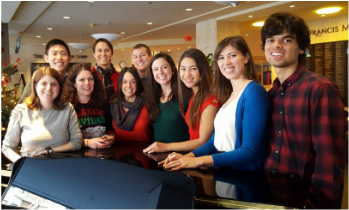 Keeva is a co-ed group who sings globally inspired a cappella music, and rehearses every Monday night from 7-9pm in the city of San Francisco. Check out our facebook page for recent performance videos, including a viral hit version of jingle bells and a performance at ODC accompanying a modern dance piece. If you're interested in auditioning or want more information please e-mail keevasf@gmail.com. Keeva A Cappella sings globally-inspired music, bringing harmonies from around the world to the Bay Area. We are available for private parties, fund-raisers, weddings and more! Please email us. We are looking for both male and female singers to join us! We sing four-part harmony folk and traditional songs (and more) in a fun and laid-back atmosphere. We rehearse Monday evenings in San Francisco, and we sing at events, fundraisers, for community groups and schools, and at a couple of larger concerts each year. Contact us at keevasf@gmail.com with info about your musical experience and background if you're interested in auditioning for us. Connect with us on Facebook or Twitter, and we will update you on future shows!